I picked up The Paris Librarian on impulse one day at the library. It was part of a display of books with a library/librarian theme, and it just caught my eye (kudos to the librarian who put the display together!). 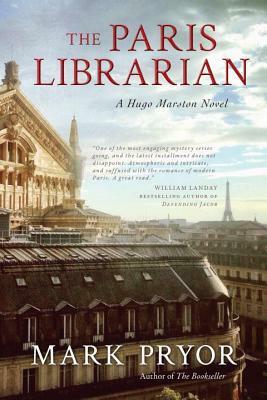 I liked the cover, I was in the mood for a good mystery, and I liked that a librarian was somehow worked into the plot. The novel stars Hugo Marston, a former FBI agent turned chief security officer of the US Embassy in Paris. When his friend Paul Rogers, director of the American Library in Paris, it appears to be a heart attack. However, Marston's finely tuned instinct nags at him, and when Marston's girlfriend dies not long later, Marston is convinced that both were murdered. The mystery involves an elderly famous actress suspected of spying on Nazis in World War II, a locked room, a senile old woman, rare poison, a secret passage, nosy journalists, and lots of visits to Paris cafes for coffee and delicious food (okay, that last thing isn't actually part of the plot, but it goes a long way toward setting the mood and making me hungry). The plot and mystery were interesting and well-paced, the characters felt real, and the setting -- as I mentioned -- was a well-written and vivid part of the story. There were a few spots of exposition -- mostly inner monologue of the main character's -- that felt a little clunky, but it didn't detract from my enjoyment of the book overall. Plus, I didn't know it when I picked up the book, but it's the sixth in a series featuring Hugo Marston. (thus a bit of exposition expected) There are a few things that characters reference that I'm guessing took place in earlier books, but I certainly felt that the book worked well as a stand-alone. Bottom line: a good read if you're in the mood for a classic, locked-door type detective mystery novel, or a visit to Paris (and don't mind a little murder mystery on the side). 1. St. Patrick's Day was my Grandpa Rush's birthday and my grandparent's (Rush) wedding anniversary. So it's a bit of a bitter sweet day in my family. A good day for remembering loved ones in heaven, but a little sad because we miss them. 2. In the spirit of remembering, here's are two fun facts about my grandparents: 1. My grandma essentially made the first move. Her cousin and my grandpa were friends, but when my grandparents met, my grandma was dating someone else, and they didn't live in the same town. After my grandma was single, she called my grandpa once and said she was coming to Kansas City (where he lived) with -- I can't remember who now. Maybe her cousin? -- and why didn't he show her around while she was there? Boom. 2. My grandpa was in the Navy in the 50s, an underwater demolitions specialist -- basically what turned into the Navy SEALS. 3. In addition to being a holiday on which I think about my grandparents, I also get a bit melancholy around this time now that we don't live in North Carolina. Our good friends the Reeds used to host a fantastic St. Patrick's Day party every year. An excuse to make Irish stew, scones, eat yummy bread with Irish butter, listen to Flogging Molly, and occasionally bust out a good flick like Waking Ned Devine. Every year I contemplate hosting my own "Swagger Party -- Texas edition", but so far the idea hasn't quite made it out of the gate, But it will. Sing Street (movie) -- 80s, music, high school, love, family, friends, misfits, brothers, dreams, heartbreak. SO GOOD. An Irish Country Doctor (book), by Patrick Taylor -- small town, quirky, loveable characters, wonderful sense of place. Moone Boy (Hulu original series) -- 12 year old boy's imaginary friend (Chris O'Dowd) helps him navigate the ups and downs of life as a 12 year old boy in Boyle, Ireland. Hilarious, heartwarming, and just delightful. I've been on a few middle-of-nowhere country runs the past few days, and since I need to be able to hear as well as see cars and dogs, I haven't taken by headphones. But it's amazing what kind of writing I can get done in my head while I'm running. The problem then comes when I try to sit down and write it out later. Sometimes, by the time I get to a computer or even a piece of paper, the words are gone or I can't quite capture the same thought. So I've decided I need a device that I can hook up to my brain to put thoughts directly into written words. Someone get on that. I'm sure nothing could go wrong, right? Today on my country road run, I was thinking about one side effect of training for a race: I want to talk about running all the time. One of my friends in town is training for the same race, and it's his first one! He's not been a runner previously, so while I'm trying to offer encouragement and tips, I'm trying to do it in small doses because he's not hooked yet. But he does do CrossFit, so he at least understands when I get excited about it and want to talk about it. Anyway, I miss my running buddies so much during these times. Fortunately, we have phones and texting to keep in touch, and I have some amazing online running friends who I can talk to about running all the live long day. And they get it. It's nice to be gotten (is that a word? whatever. I'm going with it). I think that's one of those things that we all want -- that we all need, in fact -- to be "gotten." To be seen, and heard, and known. I hope you all have someone, or lots of someones, in your life who make you feel seen, and heard, and known. Who get you. And know that even during those times when we don't even get ourselves (hello teenage years), God gets us, he knows us. Better than we know ourselves. I'm on a podcast kick these days. What's a podcast, you may ask? Think, radio talk show, except you access it through the internet. I'm relatively new to podcast listening, but in my limited experience so far, it seems like you can find a podcast for anything. There are a lot of entertainment and popular culture related podcasts, preaching and Bible-based podcasts, books, film, how-to, travel, business, economics, politics, lifestyle, fashion....you get the picture. For me, it all started with the NPR quiz show Wait, Wait, Don't Tell Me (did you know you can access A LOT of NPR shows as podcasts? No need to be near a radio at a certain time!). Then, a recommendation for The Happy Hour with Jamie Ivey....which led to recommendations for Marriage is Funny and The Popcast....which led me to The Lazy Genius Collective web site....and of course she has a podcast too! You get the picture. So, I've started listening to these podcasts when I would previously listen to audio books -- on runs and walks, washing dishes, folding clothes, etc. A friend and I were talking about it, and when I commented on how I've been doing a lot more podcast listening than audiobook listening, she compared it to magazine reading versus book reading; sometimes, when you mostly have smallish chunks of time, reading a magazine (or listening to a podcast) is a lot easier and sometimes more enjoyable than reading a book. And I think she's spot on. The whole idea behind this podcast is making listeners feel like they are sitting down with two amazing women -- our host and her guest -- and chatting over coffee or a glass of wine. Jamie and her guests talk about life, faith, family, travel, work, dreams, struggles, and joys. Everything from the death of a loved one to favorite mascara, from living and working abroad to parenting challenges and starting a business. She's talked to moms of littles, moms of grown-ups, women with no children, and single moms. Writers, entrepreneurs, speakers, philanthropists, musicians, and people with some truly unique and interesting stories. Many of you are probably familiar with the NPR show This American Life, and when it comes to my personal podcast playlist, this is probably the most book-like show. Each episode has a theme, and the show is built around that theme: with interviews, essays, and various stories built around that theme. It's along the lines human interest, long-form journalism. I don't listen to it regularly, but when I'm in the mood for something often informative and always engrossing, this is my go-to. This show is currently on hiatus, but there's three seasons of episodes available to listen to. It's a tough podcast to describe, because when I try it just sounds boring: a married couple talks about life, and marriage. Yawn. But it's really a lot of fun. The idea behind it, is that "perfect love" only exists in the context of God, so in our relationships (specifically marriage), pursuing "great love" is more attainable and sustainable. It's the idea that creating a community of other married couples is so valuable -- knowing you're not alone in the struggles and challenges that come when pursuing that great love. Some episodes are light -- like going out for drinks with good friends -- and some dig a little deeper, like a good session of couples therapy. Gerard and Jessie are funny, genuine, and have a heart for encouraging marriages and relationships.